Aristolochia fimbriata is a small herbaceous perennial in the basal angiosperm family Aristolochiaceae. The family contains diverse floral forms ranging from radial to monosymmetric flowers with a wide variety of insect pollinators. Additionally, Aristolochia species contain secondary metabolites that are important natural toxins and traditional medicines, and are critical to the reproduction of swallowtail butterflies. These characteristics, in combination with the small genome size and short life cycle of A. fimbriata, have prompted further development of this species as a model system to study the evolution of basal angiosperms. As a prerequisite for developing a genetic transformation procedure for Aristolochia, we developed protocols for in vitro plant multiplication, shoot organogenesis, rooting, and acclimation of tissue culture-derived plants. Two varieties of Aristolochia were multiplied in vitro and rooted with 100% efficiency. Shoot regeneration was achieved within 1 month of culture initiation from whole leaf, internodal stem, and petiole explants. The highest regeneration success (97%) was recorded for stem explants. Regenerated and rooted shoots were acclimated to greenhouse conditions and developed flowers within 4 weeks of transplanting. This work was supported by National Science Foundation (NSF) grants to C. dePamphilis and H. Ma (DBI-0115684 and DBI-0638595) and to M. Guiltinan (NSF 430-47/60A), a Department of Energy (DOE) grant to H. Ma (DE-FG02-02ER15332), and by the Department of Biology and Huck Institute of Life Sciences of the Pennsylvania State University. We thank M. Guiltinan for providing the tissue culture lab and growth facility space, and for editing this manuscript. We also thank L. Rosen and Jardin Botanico, Universidade de Coimbra for providing seeds; Anthony Omeis for plant care; Brett Shook, Laura Warg, and Paula Ralph for assistance with tissue culture experiments; Guanfang Wang, Zhe Chen, and Yan Zhang for statistical support, and Dr. Stefan Wanke for valuable discussion. 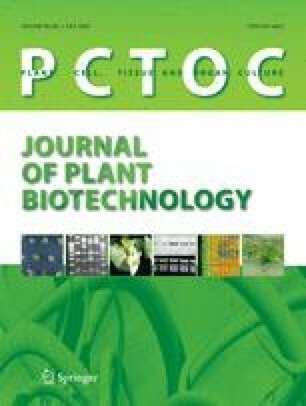 Our initial efforts in developing a micropropagation system for Aristolochia fimbriata were aided by the unpublished findings of C. Bravo, G. Yormann, and B. Llorente, recorded in Acta Horticulturae conference proceedings (1999).